Here's a great example of a local glasses store doing some smart marketing with a simple Polaroid. Not high dollar, but creative, because they thought about what is impacting their customer's buying decisions and helped them along with it. They went from a store to a fashion partner, for about $39.99 and a couple rolls of film. Nice work. My friend Rekha told me about this optical shop up at Harvard Square called Eye Q Optical. They recognize that choosing the right frames can be a difficult job. They do a smart thing. They take a Polaroid snapshot of you with the glasses on so that you can show it to your friends and see what they think. Word of mouth by design. I've always loved the Polaroid experience and how instant printing changes the entire routine and protocols of picture taking. It's a great marketing tool, too, whose novelty is based on its obsolescence. 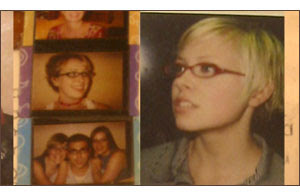 Polaroids have been used in bar promos forever, the company's site even has a Diageo case study about it. The company also sells branded instant film, in case you are interested.